Jet lag can have it’s advantages; learn your mates sleeping habits and you could find yourself with a few extra photos taken at the time of day YOU want to shoot. A light load is a dream for most people. Here I kept my computer, clothing, and camera gear to a minimum. I have arrived! Before we get to the tips of the day, I thought you might like to see my gear load. 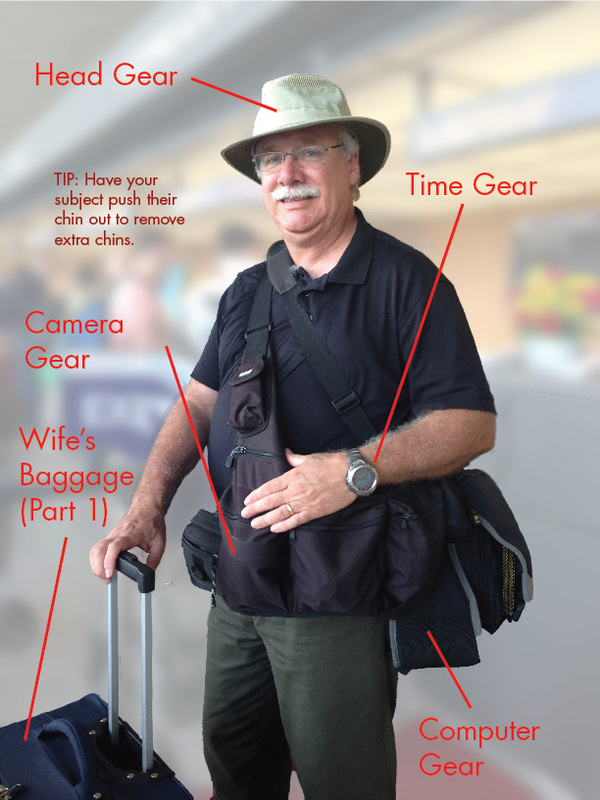 My wife took this photo of me at Dulles International Airport just before we placed our suitcases on the belt. The bag that my camera gear is made by EURO. It has 3 large pockets, two of them are big enough for 72mm diameter lenses and a some other handy tiny zippered pockets. It is not a camera bag; it is a messenger bag. I purchased it for $7 at a local thrift store. The computer bag is a Targus, also purchased for $7 at the same store. Ok, so yea it was the first day and everyone has jetlag but I found myself waking up at 5AM and my wife didn’t even think about getting out of bed until 9AM. What this means is, if I pack up my gear then night before, have my clothing layed out where I can find it in the dark, I could get dressed and out the door to photograph some kind of location during sunrise. What’s even better is after that is done, I can probably get back in time to take a nap before the Mrs. wakes up.